By Bogna Haponiuk and Łukasz Białek - MD. How to calculate cholesterol ratios? This cholesterol ratio calculator allows you for a quick self-diagnosis. Basing on your blood test results, it calculates the most popular cholesterol indicators (LDL/HDL, triglycerides/HDL, and total cholesterol/HDL ratio), making it easy to assess heart disease risks and your general health condition. Read on to learn how to calculate these cholesterol ratios or take a look at our BMI calculator. Remember that this calculator is in no case an equivalent of a doctor consultation! If the results are troubling, remember to pay a visit to your physician. Our cholesterol ratio calculator takes into account four basic blood test results. All recommended levels are according to the National Heart, Lung, and Blood Institute within the National Institutes of Health. Total cholesterol is just an overview of your cholesterol level. It might be misleading, as it combines the levels of good and bad cholesterol in your blood, and does not give sufficient information about heart disease risks. HDL (High-density lipoprotein) is the "good" cholesterol in your blood. Generally speaking, it is a form of cholesterol which is transfered from other parts of your body to the liver in order to metabolize it and remove from the body with bile acids. That's why this is the only cholesterol type that should be kept high. Women tend to have slightly higher HDL levels than men. LDL (Low-density lipoprotein) is the "bad" cholesterol that accumulates in your arteries and can cause serious medical conditions, such as heart strokes. The lower the LDL level, the better. Remember that if your LDL level is high, you should consult a doctor to investigate risk factors that can lead to heart diseases. Use our LDL calculator to estimate its value based on total cholesterol, HDL and triglyceride levels. Triglycerides are not actually cholesterol, but a type of fat transported within your blood. Most of the triglycerides in your body are stored as body fat. Still, high triglyceride levels may be a sign of a lipoprotein problem, as other symptoms such as diabetes often accompany it. It is also crucial to know that desirable values of different cholesterol fractions may differ regarding the patient and his/her cardiovascular risk! To ensure yourself about your results don't hesitate to consult it with your doctor! There are three indicators that describe your heart disease risk with high accuracy. They are all built as ratios of the aforementioned blood results, and are therefore called cholesterol ratios. LDL HDL ratio is simply the LDL level divided by the HDL level. LDL HDL ratio is one of the most popular measures of a heart disease risk. Triglyceride HDL ratio can be calculated by dividing your triglyceride level by HDL level. It's a less popular indicator; nevertheless, it is also used to determine heart stroke risks. Check out our cholesterol units calculator to fully understand the conversion between mmol/L and mg/dL units. Total cholesterol HDL (TC HDL) ratio is found by dividing the total cholesterol level by the HDL level. Cholesterol HDL ratio is considered the worst of these three indicators - the American Heart Association does not recommend using it for diagnosis. Still, you can look at this number to get a general idea of your health condition. Without cholesterol, the life of humans and animals would not be possible. It is an essential structural component of cell membranes, and is needed in the process of production of steroid hormones, bile acids, and vitamin D. Moreover, you should notice that in certain clinical situations there are too low levels of cholesterol, but it is not very often. This is so-called hypocholesterolemia. It is usually caused by hyperthyroidism (excessive production of thyroid hormones), adrenal insufficiency, liver diseases, depression, cerebral hemorrhage, or cancer. In sporadic cases it is caused by SLOS (Smith–Lemli–Opitz syndrome) - a genetic abnormality in the process of synthesis of cholesterol. This is why it is so important to know and regulate your cholesterol levels to minimize the risk of atherosclerosis, and its consequences! As mentioned before high levels of cholesterol may have a substantial impact on our overall life. So it's worth knowing what are the causes of high cholesterol. Hypercholesterolemia is often caused by thyroid insufficiency, type 2 diabetes and obesity. It may also be caused by genetic disorders, such as familial hypercholesterolemia, which is not that rare - about 0.3% of the population have mutations causing high LDL-cholesterol! Nevertheless, the most important factor influencing your lipid and cholesterol levels is your lifestyle! Diet has an impact on cholesterol levels, but the size of its impact differs between individual patients. The results of meta-analysis Does Dietary Cholesterol Matter? published in 2016 reveal that the intake of high-cholesterol food causes an increase in serum cholesterol levels. Also trans fatty acids have a strong atherogenic potential - they reduce levels of HDL-cholesterol (good cholesterol) while increasing levels of LDL-cholesterol (the bad one). If you are in the risk group of hipercholesterolemia, check out blood sugar converter and calorie calculator, and start living healthier! Get regular aerobic physical exercise. It has been proven that regular exercises increase HDL cholesterol (good) and decrease LDL cholesterol (bad). Moreover, it may also lower your risk of heart attack or stroke, as it reduces the blood pressure. Diet. Eat foods low in fatty acids, saturated fats, and cholesterol. Don't forget to include in your diet fish as they are a source of omega-3 fatty acids. Consider eating cholesterol-lowering foods, such as margarine, enriched with plant sterols and stanols. Use medications. If the non-pharmacological ways of treatment don't bring satisfactory results, don't hesitate to contact your doctor who may propose drug therapies. There are numerous drugs which can be used to lower your bad cholesterol and correct your LDL HDL ratio. It has been scientifically proven that they not only lower down the cholesterol but also decrease cardiovascular risk (risk of heart attack, stroke, etc.) and prolong life. Don't be afraid to do good changes in your life. 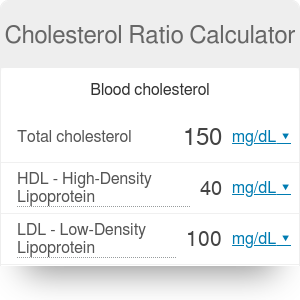 Calculate your LDL HDL ratio and other ratios using our cholesterol ratio calculator. Lower your cholesterol, treat hypertension and diabetes, check for abnormalities in your ECG, protect your heart and live healthier, longer and happier! Bogna Haponiuk and Łukasz Białek - MD. Cholesterol Ratio Calculator can be embedded on your website to enrich the content you wrote and make it easier for your visitors to understand your message.